Desert Village is a small gated subdivision with a community pool in North Scottsdale, subdivision in the Pinnacle Peak area. Desert Village offers two and three bedroom homes built by Pinnacle Builders and range in size from 1400 to 1800 square feet. Great location offers easy access to the Loop 101 and numerous amenities including golf, shopping, and dining. Canada Vistas is a gated 42 single family home subdivision located in Beautiful North Scottsdale's 85255 zip code. Canada Vistas is just south east of Pinnacle Peak and Pima Rd in North Scottsdale. Canada Vistas homes, built by Monterey Homes, range in size from 2600 to 3000 square feet. Close by you will find shopping, entertainment, great schools and amazing recreational opportunities including world class golf courses, bicycle and hiking trails with breathtaking views of surrounding mountains. White Horse is a proposed 50 lot residental subdivision on 58 acres at Pima and Los Gatos Roads. This gated subdivision, developed by Camelot Homes, has 23 homes North of Los Gatos and 27 homes South of Los Gatos. A 100 foot scenic provides a buffer between homesites and Pima Road, a major North/South arterial street. Mirage Village is located east of Pima Road in North Scottsdale's 85255 zip code. There are 48 condominiums in Mirage Village, with floor plans ranging from 1200 to 1600 square feet. Mirage Village floor plans off 2 or 3 bedrooms, and a detached 1 car garage. These condominiums, built by Mirage Builders in 1996, make a convenient lock and leave residence. Great location offers easy access to the Loop 101 and numerous amenities including golf, shopping, and dining. Prado Estates is an exclusive gated community of luxury estates off of Pinnacle Peak Road. This North Scottsdale community consists of custom homes situated on multi-acre lots, ranging in size from 8000 to 12000+ square feet. Eighteen custom homesites range from 4.3 acres to just under 5 acres, which plenty of room for tennis courts, guest quarters, and multi-car garages. Prado Estates also offers amazing privacy to its residents along with spectacular views of the city, McDowell Mountains, and Pinnacle Peak. Homes sites still available. Entrance to Prado Estates is just past Highlands Church on Pinnacle Peak. Canada Ridge is a 61 single family home subdivision located in Beautiful North Scottsdale's 85255 zip code. Canada Ridge homes, built by Monterey, range in size from 2200 to 3000 square feet. Close by you will find shopping, entertainment, great schools and amazing recreational opportunities including world class golf courses, bicycle and hiking trails with breathtaking views of surrounding mountains. Carriage Hills is a gated 68 single family home subdivision located in Beautiful North Scottsdale's 85255 zip code. Carriage Hills is just south of Pinnacle Peak Road in North Scottsdale. Carriage Hills homes, built by Maracay Homes, range in size from 2,200 to 3,600 square feet. Within walking distance to 2 shopping centers including AJ's grocery, fine dining, hair salons, and more! It's a short drive to shopping, entertainment, great schools, great healthcare and amazing recreational opportunities including world class golf courses, bicycle and hiking trails with breathtaking views of surrounding mountains. 'Pinnacle Peak Vistas 4' is also known as 'The Tradition'. Pinnacle Peak Shadows is a 87 home subdivision in the Pinnacle Peak area, South of Pinnacle Peak Road. Homes range in size from 2400 to 5500 + square feet and are located on 1/3 to 1/2 acre lots. Most homes were built in the late 1980’s and have been fully or partially remodeled. Pinnacle Peak Shadows is close to many amenities including golf, shopping, dining, and the 101 Freeway. Pinnacle Peak Circle is a 5-lot subdivision in North Scottsdale, located South of Pinnacle Peak Road. Each custm home sits on 1+ acre lot, and enjoys views of McDowell Mountains, and has easy access to shops, dining and the 101 fwy nearby. Pinnacle Peak Vistas is a 380 custom home residential community located east of Pima Rd, in the Pinnacle Peak Area of North Scottsdale. Pinnacle Peak Vistas custom homes range in size from 3500 to 6300 + square feet and are situated on 1+ acre lots. This North Scottsdale subdivision, in the 85255 zip code, is close to many amenities including golf, shopping, dining, and the 101 Freeway. Note: 'Pinnacle Peak Vistas 4' is also known as 'The Tradition'. 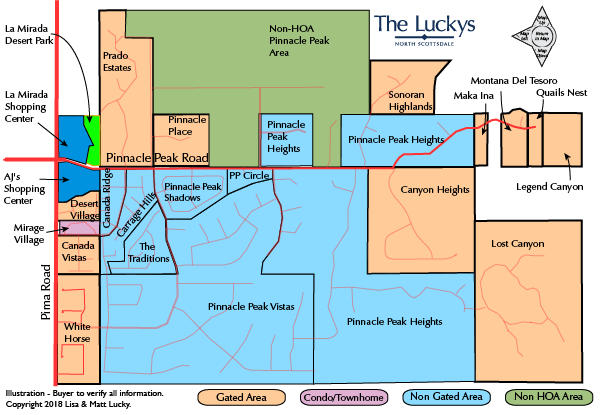 Pinnacle Peak Heights is a residential community located east of Pima Rd in the Pinnacle Peak Area of North Scottsdale. Custom homes in Pinnacle Peak Heights were built between 1976 and 2009 and offer great privacy plus views views of Pinnacle Peak, McDowell Mountains, and the city. These custom homes range in size from 3,026 to 12,500 square feet in living space. Pinnacle Peak Heights is close to many amenities including golf, shopping, dining, and the 101 Freeway. Pinnacle Place is located east of Pima Road just south of Pinnacle Peak Rd in North Scottsdale. There are 8 custom homes in Pinnacle Place, each homesite is approximately 5 acres. Great location offers easy access to the Loop 101 and numerous amenities including golf, shopping, and dining. Canyon Heights is a hidden gem nestled in the McDowell Mountain landscape is a secluded haven with just 35 coveted homes on its 160 acres. These exclusive properties range from high hillside homes to valley estates - each offering unparalleled views of breathtaking sunsets, sparkling city lights and the Sonoran desert below. Canyon Heights also boasts one of Scottsdale's most convenient locations. Only minutes from the 101 freeway and, with easy access to the city's business and entertainment districts, you can live in luxurious solitude with upscale amenities just moments away. Pristine, natural, private, gated, acreage, hillside, lush ... yes, this is Lost Canyon. Nestled in a natural desert canyon, this 240 acre neighborhood will contain a maximum of thirty-five home sites. The average home site averages six acres. The vast majority of the community will be left completely undisturbed and protected. Designated building envelopes protect each homeowner's views to the panoramic mountains or blazing city lights. A 24-hour guard gate offers additional security and a truly private environment. An idyllic setting just moments from shopping and the freeway. Sonoran Highlands is a gated community of custom homes, most with views of Pinnacle Peak, McDowell Mountains, Troon Mountain, and city lights. Secluded at the end of Pinnacle Peak Road there are several small subdivisions of custom homes: Montana Del Tesoro, Maka Ina, Quails Nest, and Legend Canyon. Each offer spectacular views of Pinnacle Peak, Troon Mountain, and McDowell Mountains. Legend Canyon is a gated community with hillside homesites. The Reata Pass / Troon Character Area includes the beautiful communities of Troon Village, Desert Highlands, Estancia, Troon North and Troon Ridge. DC Ranch is master planned community in North Scottsdale offering condos, townhomes, single family homes and custom estates. This 8,300 acres community includes more than 4,600 acres dedicated to open space. DC Ranch offers amenities ranging from two private clubs and golf courses, two community centers, lush and colorful neighborhood parks, 33 miles of trails and walking paths, and much more. Pinnacle Peak To Happy Valley map, in the Pinnacle Peak Area of North Scottsdale. This is a great location close to shopping, dining, hiking, parks, and the 101 Freeway. Return to North Scottsdale Map, where you can find clickable maps of each Character Area and master planned community in North Scottsdale. This Pinnacle Peak Area Real Estate Map covers the Pinnacle Peak area East of Pima Road, North of DC Ranch and South of the Reata/Troon Area. To the East is the McDowell Mountains and the McDowell Sonoran Preserve. Shopping, dining, the General Store, and AJ’s Grocery store can be found at Pinnacle Peak and Pima Roads. Watch this short video of the Canyon Heights Community, to better understand this area. See all Pinnacle Peak East Area New. See all Pinnacle Peak East Area Sold.